MY DEAR MALEVICH exhibition by Tom R. Chambers at Art Gallery, Fine Arts Department, Zhaoqing University, Zhaoqing, Guangdong Province, China, April 2-15, 2007. The above Pixelscapes - as a homage - were found within the photo [to the left] of Kasimir Malevich [Ukranian-born artist, 1878-1935] via magnification, filter treatment [halftone] and isolation of the pixel(s) in Photoshop. Malevich founded the art movement, Suprematism in Moscow, 1913 as a parallel to Constructivism. Suprematism ["supremacy of forms"] is a study in abstraction conceived in itself - non-objective and not related to anything except geometric shapes and colors - and a precursor to Minimalism. He states, "Under Suprematism I understand the supremacy of pure feeling in creative art. To the Suprematist the visual phenomena of the objective world are, in themselves, meaningless; the significant thing is feeling, as such, quite apart from the environment in which it is called forth. I took refuge in the square form and exhibited a picture which consisted of nothing more than a black square on a white field. It is filled with the spirit of nonobjective sensation which pervades everything. This is no empty square, but rather the feeling of nonobjectivity." This homage is also a confirmation of Chambers' Pixelscapes as Minimal Art and in keeping with Malevich's Suprematism - the feeling of nonobjectivity - the creation of a sense of bliss and wonder via abstraction. Chambers' action of looking within the Malevich photo to find the basic component(s) - pixel(s) is the same action as Malevich looking within himself - inside the objective world - for a pure feeling in creative art to find his "Black Square", "Black Cross" and other Suprematist works. So as Chambers mentions in his Pixelscapes article, Malevich and those Minimalists who followed later would probably have had great appreciation for this basic and mathematical component - the pixel. And beginning in 2000, his Pixelscapes were somewhat of a revelation for him when compared to the nonobjective works of Malevich and other Minimalists generated 40 years before the pixel and 80 years before the Digital Revolution. It seemed that Chambers had managed to do what they had done through the simple process of magnification, treatment and isolation of the pixel(s). "Synchronicity is alive and well as I view your Malevich exhibition ... so reminiscent of the work and intentions of my husband's work, Laurent Boccara." "Chambers' Pixelscapes have been exhibited in Novosibirsk and also at the Solovetsky Monastery. He is working with the idea of a small unit or cell of an image, which shows a fantastical world through print and animation. He will show this new black-and-white series - MY DEAR MALEVICH - at the Fourth Novosibirsk International Festival of Digital Imaging at the Novosibirsk State Art Museum in May/June. It will be a pleasure for us to show this series that stems from the Suprematist traditions of the great Malevich. "Tom Chambers is blessed with an uncanny ability to marry high-concept with visual beauty. He demonstrates his ability to do so in his 'My Dear Malevich' exhibition, where he riffs on the work of the Suprematist artist, Kasimir Malevich, to create wonderfully intriguing Pixelscapes. Chambers' Pixelscapes merge the analog and digital worlds, and merge the past with the present to create a new kind of imagery that brings wall-based visual art into the 21st century. His work is interesting to think about, and pleasant to look at. What more can we ask for from the art on our walls?" Chambers seems to want to elucidate a subject ... make a significant attempt at clarifying a notion. His appreciation of Kasimir Malevich's Suprematist artwork is only a way or an excuse to present an artistic trend through iconography that borders on 'religion'. The Pixelscapes that comprise the project represent a collective expression. Click on TRC/MDM to view Tom R. Chambers with two of his Pixelscapes. 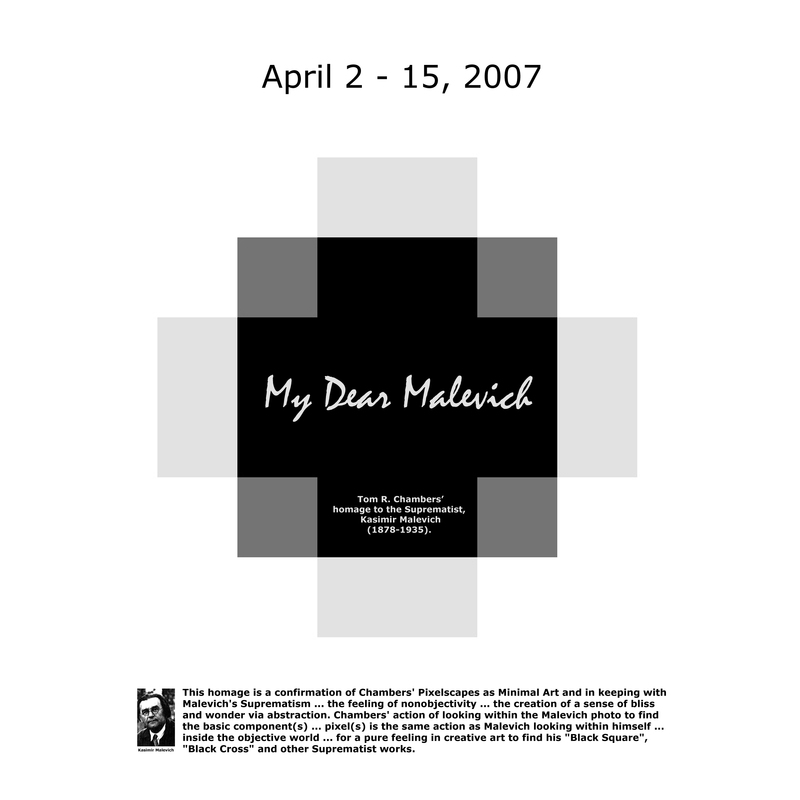 Right click on MDM to download the MY DEAR MALEVICH exhibition poster.